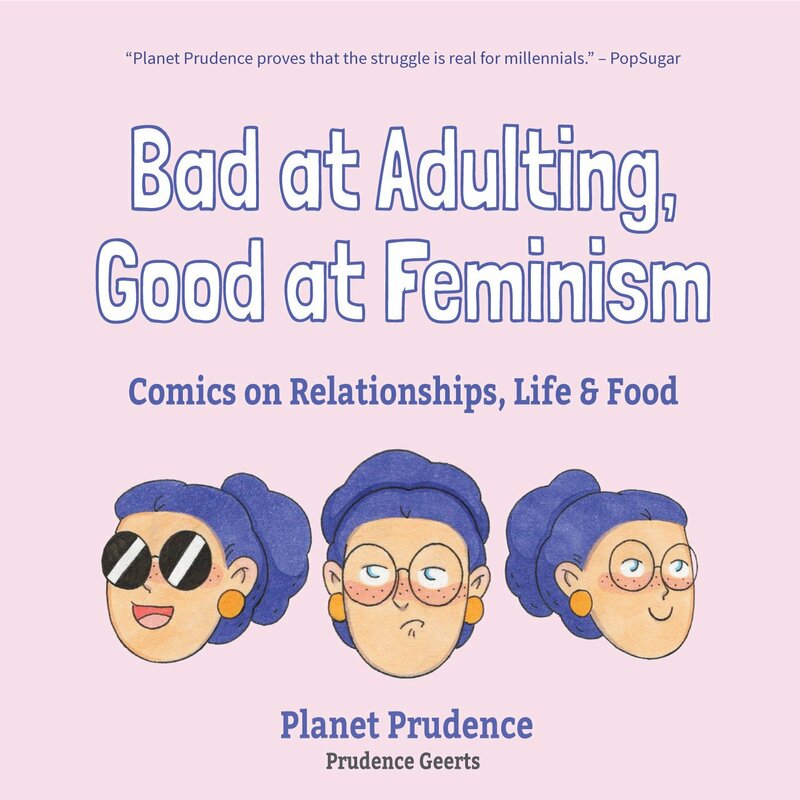 Planet Prudence is the brainchild of Prudence Geerts, a native Belgian whose online comics have been making the rounds on the Internet and social media for the last couple of years. It’s entirely possible that you’ve seen a few of her most popular panels splashed across a friend’s Facebook or Instagram at some point, and now the illustrator is offering up some of her best work and a few new comics for devotees and newcomers alike to enjoy. “BAD AT ADULTING, GOOD AT FEMINISM: COMICS ON RELATIONSHIPS, LIFE & FOOD” is primarily aimed at millennials, and especially women, but it offers up a little something for everybody. The book is broken into several chapters. Rather than providing a narrative thread, these segments are simply meant to delineate the theme of the comics presented in each part. Themes range from “Love Letters” and “Om Nom Nom” to “Finding the Strength” and “I Don’t Want to Go.” Each section offers up a brief explanation by Geerts and then a smattering of comics. Occasionally, the book suffers from a lack of flow, but it’s also easy to simply kick back and enjoy what each page has to offer on its own. The chapters make it easy to take a minute and enjoy a comic or two that speaks to your particular mood at any given moment. Many will feel a kinship with Geerts and her imperfectly human cartoon-self. Geerts’ book isn’t for the faint of heart. Her introduction details an incident of sexual harassment by a professor that caused her to discontinue her schooling, and she is open about her diagnosis of Chronic Fatigue Syndrome (CFS). Some of the best panels in the book detail body positivity, eating pizza, and especially periods. Geerts never shies away from some of the more taboo aspects of womanhood, which makes this a great book for women seeking a sisterly laugh. Her comics depicting expectation vs. reality are a cathartic read for those days you feel like you just can’t compare to the seemingly perfect women we encounter daily on TV and in advertising. “BAD AT ADULTING, GOOD AT FEMINISM” is a great little book for anyone who wants to laugh along with Geerts and enjoy a young woman’s artistic perspective on the world at large. If you’ve ever suffered from social anxiety, called your cat your best friend, or had a semi-love affair with pizza, this book is definitely for you. As the weather cools off and you start looking for a book to curl up with, keep “BAD AT ADULTING, GOOD AT FEMINISM” in mind. It’s a short, fun read, and Geerts’ comics are worth coming back to again and again. You can find this book at Philly AIDS Thrift and Penn Book Center.